Following one of the most dominant individual defensive performances in franchise history, Seahawks linebacker was named NFC Defensive Player of the Week for his play in Sunday’s 43-16 win over the San Francisco 49ers. Wagner caused two turnovers in the red zone, ripping the ball loose for a forced fumble and recovery on a second-quarter San Francisco drive, then he punctuated the Seattle victory with a franchise-record 98-yard interception return for a touchdown. In addition to the interception, forced fumble and fumble recovery, Wagner filled out every other category on the defensive stat sheet, recording 12 tackles, 1.0 sack, 2 tackles for loss, 2 quarterback hits, and 2 passes defensed. Wagner is the first Seahawks player to have an interception return for a touchdown, a forced fumble, a fumble recovery and a sack in the same game since sacks became an official stat in 1982. Somehow, despite being a three-time first-team All-Pro and a four-time Pro Bowler, this is Wagner’s first Player of the Week honor. It also marks the second consecutive Player of the Week honor and fourth of the season for the Seahawks. 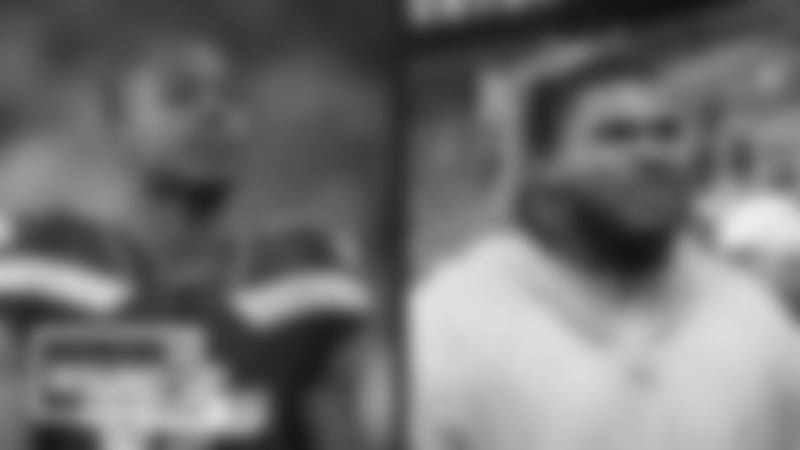 Kicker Sebastian Janikowski took home Special Teams Player of the Week last week, while punter Michael Dickson was awarded Special Teams Player of the Week in Week 8 and defensive end Frank Clark received Defensive Player of the Week in Week 6. Today's 'Social Post of the Day' comes from XFL Seattle, the new football league that's bringing a team to play at CenturyLink Field in 2020. Fans can bid on Seahawks players' 'My Cause, My Cleats' footwear over at auctions.seahawks.com, with proceeds going to charity. Bob Condotta at the Seattle Times answers reader questions about the Seahawks' right guard spot with D.J. Fluker expected to miss some time after injuring his hamstring against the 49ers this past weekend. John Clayton at 710Sports.com reviews the Seahawks' win over the 49ers, saying Seattle may be better than its current No. 5 spot in the NFC playoff hunt. NFL Network analytics expert Cynthia Frelund eyes the Seahawks' position in the playoff field. 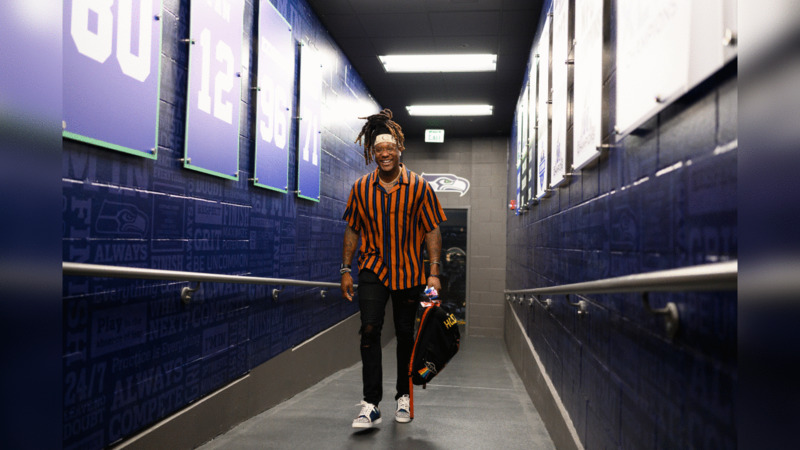 Seahawks cornerback Shaquill Griffin arrives for the game against the 49ers. Seahawks linebacker Bobby Wagner talks with former teammate Brock Coyle on the field during early pregame warmups. Linebacker Shaquem Griffin warms up during early pregame. Former teammates and still friends Richard Sherman and Doug Baldwin talk on the field hours before kickoff. In the locker room, Shaquill Griffin laces up his custom painted shoes he had designed for the week's "My Cause My Cleats" game in which players could wear custom cleats to benefit their chosen charity. Shoreline native and current Tampa Bay Rays pitcher Blake Snell, winner of the 2018 Cy Young Award, playfully pitches to Seahawks mascot "Blitz" during pregame. Seahawks receiver Doug Baldwin talks to his receiver teammates during pregame warmups. Chris Carson's custom painted cleats lie near his helmet and gloves at his locker. The Seahawks make their way through the fog shrouded tunnel during pregame introductions. Seahawks flag runners make their way onto the field during pregame introductions. Seahawks receiver Tyler Lockett is introduced. Seahawks linebacker Bobby Wagner sacked 49ers quarterback Nick Mullens to end the first drive of the game. Bobby Wagner hits 49ers quarterback Nick Mullens in the first quarter. Seahawks quarterback Russell Wilson huddles the offense in the first half. An assortment of the custom cleats worn by Seattle players for "My Cause My Cleats" is visible in the Seahawks huddle with Russell Wilson's cleats visible in the foreground. Seahawks defensive lineman Jarran Reed hits San Francisco's Nick Mullen. Seahawks quarterback Russell Wilson watches as receiver Tyler Lockett comes in motion before the snap. Seahawks receiver Jaron Brown catches a pass from Russell Wilson and turns it into a 45-yard gain to set up Seattle's first touchdown. Seattle's Rashaad Penny looks for room behind the block of center Justin Britt. Seahawks quarterback Russell Wilson stretches towards the line to gain for a first down. Seattle's Jaron Brown gets open in the corner for the first of his two touchdown receptions against the 49ers. For their celebration of Jaron' Brown's touchdown Seahawks receivers Brown (not pictured), David Moore, Doug Baldwin and Tyler Lockett recreated former teammate Richard Sherman's famous "tip" that sealed the NFC Championship Game over the 49ers in 2013 that sent Seattle to the Super Bowl. Seahawks receivers David Moore and Doug Baldwin celebrate in the end zone. Seahawks Bobby Wagner and Branden Jackson close in on 49ers quarterback Nick Mullens after a botched snap in the first half. Seahawks receiver Tyler Lockett hauls in a 52-yard touchdown pass from Russell Wilson in the second quarter. Seahawks receiver Tyler Lockett high-fives fans in the end zone following his touchdown. Seattle's defensel including Dion Jordan, Austin Calitro, Bradley McDougald and Shaquill Griffin flock to stop San Francisco running back Matt Breida. Seattle's Bobby Wagner looks for running room after recovering a fumble in the second quarter. Seattle's Bradley McDougald puts a punishing hit on San Francisco running back Matt Breida. Seahawks quarterback Russell Wilson fired four touchdown passes in the victory over the 49ers. Seahawks receivers Tyler Lockett and Doug Baldwin celebrate after Baldwin's touchdown reception in the second quarter. At halftime, defensive line coach Clint Hurtt talked to the defense. Seattle's Tyler Lockett opened the second half with an 84-yard kickoff return. Seattle's Pete Carroll celebrates on the sideline after Tyler Lockett's 84-yard kickoff return to begin the third quarter. Seahawks running back Rashaad Penny races 20 yards for a touchdown on the first play from scrimmage of the third quarter, set up by Tyler Lockett's 84-yard kickoff return. Seattle offensive line coach Mike Solari congratulates the offense after Rashaad Penny's touchdown. This young 12 was fired up for the Seahawks contest against division foes the San Francisco 49ers. Seahawks safety Bradley McDougland flies to deflect a pass in the third quarter. Seattle's Doug Baldwin escapes the would-be tackle of his friend and former teammate Richard Sherman in the third quarter. Seattle's Branden Jackson and Justin Coleman combine to sack 49ers quarterback Nick Mullens. Seahawks defensive tackle Poona Ford drops San Francisco's Jeff Wilson, Jr. during the third quarter. Seattle's Quinton Jefferson celebrates after sacking San Francisco quarterback Nick Mullens. The Seahawks celebrate Jaron Brown's second touchdown of the game, an 18-yard completion from Russell Wilson. 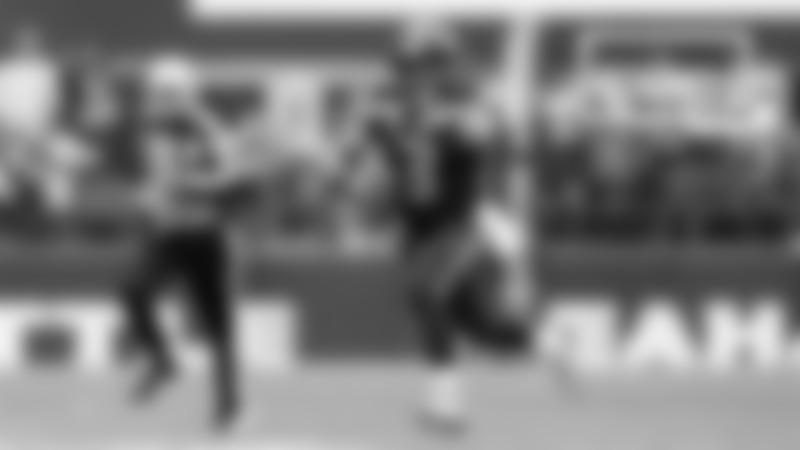 Seahawks receivers danced "the Macarena" as their end zone celebration after Jaron Brown's fourth quarter touchdown. Seahawks linebacker Bobby Wagner intercepts a 49ers pass near the goal line and heads upfield. Seahawks linebacker Bobby Wagner passes by the 49ers sideline and former teammate Richard Sherman, racing 98-yards with an interception return for a touchdown in the fourth quarter. In the victorious Seahawks locker room, quarterback Russell Wilson and offensive coordinator Brian Schottenheimer congratulate each other. Wilson threw for four touchdowns in the victory.